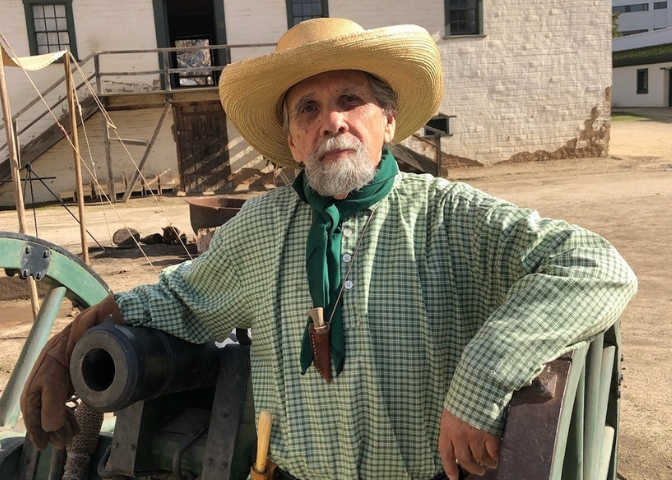 Bill Pickering (also known as Grizzly Bill) has been a docent at Sutter’s Fort State Historic Park (SHP) for 10 years and has volunteered over 5250 hours of service to the park. We recently had the honor to present Bill with the True Friend Award, recognizing his longstanding service to both Sutter’s Fort SHP and Friends of Sutter’s Fort. I got involved after I retired and moved to Sacramento and read in the paper that they were looking for docents at the Fort. I didn’t realize at the time that I answered the ad that my daughter was a teacher who had done ELP. When I told her she was very excited and she knew that I would love doing it. I would say that my favorite thing to do is fire the cannon for the kids during the Environmental Studies Program (ESP) and Environmental Living Program (ELP). I also like being able to sign up for where needed (so that I can experience many of the stations) and enjoy making candles and packaging for the Sutter’s Fort Gift and Trade Store. Some of my favorite memories are of doing the Haunted Fort and Candlelight Tours when it was easier for me to drive at night and I could participate. I loved having fellow docent Diana King operate on my head during the Haunted Fort, and being a sailor pretending to be a Californio during Candlelight Tours. In my spare time, I like to volunteer a couple of hours a week reading the Rite Aid, Walgreen’s, and Trader Joe’s ads for the Society for the Blind. I am also a member of the Native Sons of the Golden West, and I belong to the Scottish Free Artillery where we do demonstrations of the English Civil Wars of the 1650s by firing matchlock muskets and a leather cannon at several of the Scottish Games. Thank you “Grizzly Bill” for all that you do!